SCVHistory.com | Film-Arts | Separation of Mr. & Mrs. William S. Hart, 1922-23. Separation of Mr. & Mrs. William S. Hart. Romance of Bill Hart Is Now Blasted. As Published in the San Bernardino County Sun | August 10, 1922. Los Angeles, Aug. 9. — William S. ("Bill") Hart, moving picture star, late today issued a signed statement that he and his wife, Winifred Westover, film actress, had separated about three months ago, that a property settlement had been effected providing for her maintenance and that of their unborn child and that he had no knowledge of any plans of Mrs. Hart for instituting divorce proceedings. Hart also made public a copy of a night letter he said he had sent to Will H. Hays, president of the Motion Picture Producers' and Distributors' Association of America, declaring he was not responsible for statements published here that Mr. Hays had attempted, when in Los Angeles recently, to effect a reconciliation between Hart and Miss Westover. Hart's statement came after several weeks of rumor that all was not well in the Hart household and that Miss Westover had left her husband in his Hollywood home and had taken up her residence with her mother at Santa Monica, a suburb. "As all the newspapers of Los Angeles are aware, I have repeatedly, and up to this moment, denied there has been any difficulty between Mrs. Hart and myself. "A Los Angeles paper publishes an article this afternoon containing statements which the paper intimates came from Mrs. Hart's attorneys — and some of them are villainously untrue — particularly the ones referring to Mary Hart, my sister, and to Will H. Hays. "Mrs. Hart and myself separated about three months ago and a few days later property contracts were executed, making ample provisions for her maintenance — as well as for our unborn child, which is expected in September. Whether she contemplates divorce proceedings or not, I have no knowledge." Hart Divorce Next One On Boards Is New Intimation. Modesto Evening News | February 14, 1923. Los Angeles, Feb. 14. 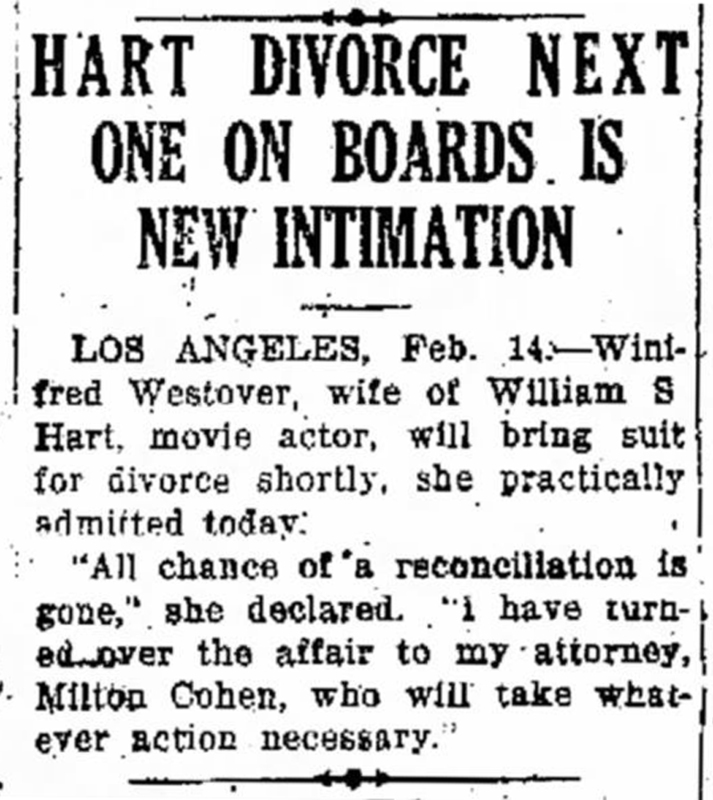 — Winifred Westover, wife of William S. Hart, movie actor, will bring suit for divorce shortly, she practically admitted today. "All chance of reconciliation is gone," she declared. "I have turned over the affair to my attorney, Milton Cohen, who will take whatever action necessary."